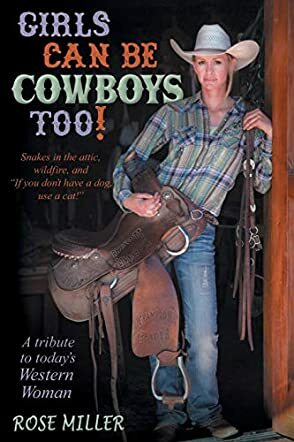 Snakes in the attic, wildfire and "If you don't have a dog, use a cat"
Girls Can Be Cowboys Too by Rose Miller is a collection of real and honest stories from women who open up about their experiences dealing with country life. A few share their experiences as cowboys, but all are connected through their work with animals, ranch life struggles, and their desire to help people and animals. Several open up about their trails training mules, experiences with endurance races, and even how they use animals as therapy to help people. Women featured include Bonnie Ebsen Jackson and the T.H.E. Ranch which uses equines as part of a therapy program, Shelly Godfrey and her work with therapy dogs, and Vaughn Colleen Smith and her experiences with cattle. Just a few of the many amazing women who share their stories with photos also included throughout. Rose Miller connects these personal stories of several women through insights into ranch life and dealing with animals. Each story is inspiring with heart and an emotional look at their lives, aimed at female cowboys, those wanting to learn about country life, and animal lovers. Girls Can Be Cowboys Too is inspiring with strong women role models. Several of the stories stand out with each leaving an impression. Miller has a way of delving straight to the heart of each of their experiences, and through her own opinion, she draws out the inspiration they bring. None of the stories strays from being honest about dealing with situations such as vaccinations for horses, Parvo in dogs, and even various dangers like snakes. One of the most compelling parts that stood out is the connection between animals and therapy. A few of the women share how horses and, in some cases mentioned, dogs, are used to help others such as veterans with PTSD, a little boy processing his mother's death, and an autistic girl who liked putting on shows with the horses. These moments are powerful because they show the way animals can help people process the various struggles they're facing. Anyone from the country or living on a ranch or who just loves animals will feel a deep connection to each of these stories. Incorporated throughout are photos which add to the personal tone of the book by having her own connection to them. This also allows for a connection to form with Miller and to get to know her. The stories shared are eye opening with honest experiences about life in the country and with animals, and independent women to look up to. Girls Can Be Cowboys Too is full of inspiring stories from women whose experiences are honest and grounded, showing another side to the idea of cowboys. Women have been pioneers in the West since the earliest days, and that tradition continues today. In Girls Can Be Cowboys Too! Rose Miller introduces us to over 30 strong, independent women of Arizona who exemplify the pioneer ethic. Each woman is interviewed by Rose, who shares their experiences, heritage and passion for the land, their animals, and their professions. Interspersed with Rose’s interviews are some poetry, essays, and beautiful photographs. The women that Rose interviews have many different backgrounds, interests, and experiences, but through the interviews you see a common thread of strong, independent women who not only survive in a world that is traditionally dominated by men, but thrive in it. I enjoyed Rose’s interview with Bonnie Ebsen Jackson, daughter of actor Buddy Ebsen, and who uses equine-assisted activities to help people face mental health issues, opiate addiction, and emotional issues. Cheryl Searer’s story of endurance horse rides and her experience in the Tevis Cup Race – a hundred-mile race through the California high Sierra – was also very interesting for a non-horse person like myself. The interviews of Leslie Turek, Carol White, and Michelle Warburton are educational with their work in Search and Rescue and working with search dogs. The stories feature photos of the women and their animals, and this provided a nice, intimate connection to each person. Girls Can Be Cowboys Too! is a unique collection of interviews with strong, independent women from Arizona. Their experiences will provide an entertaining diversion and give you a glimpse into the lives of the women that carry on the pioneer tradition. Girls Can Be Cowboys Too! by Rose Miller is a non-fiction biographical sketch of women who handle all of the things on a ranch that cowboys do and what their lives and experiences are like. Rose has refrained from using the word “cowgirl” since it does not seem to imply the same level of ranch or animal expertise that the word “cowboy” does. The book is composed of chapters that detail the lives of each of these ranch women from various parts of the US, generally the southwestern part of the US. The stories cover tales that showcase a love for animals, be they horses, dogs, or any animal for that matter, the many jobs that need to get done on a ranch and how these women manage them, their early backgrounds and how they learnt the skills to be ranch women, their love of the land and nature, fighting the inevitable natural disasters at times such as wildfires, animal rescue and preventing cruelty and abuse of animals, and more. I liked reading Girls Can Be Cowboys Too by Rose Miller and loved that it showcased the relatively little known ranch women or wives who have a huge share in running these ranches. There is a lot of focus on animal and pet stories in this book and issues such as animal slaughter, and animal abuse definitely need to be brought to mainstream society’s attention which this book attempts to do, which I appreciated. The stories range from humorous, to exciting and adventurous, or even sad at times. In short, these stories are more than just events in the lives of these women, but showcase their day-to-day lives and emotions. Rose’s casual and authentic writing style makes this a fun and educational read.